Specialists in Business Aviation Marketing. 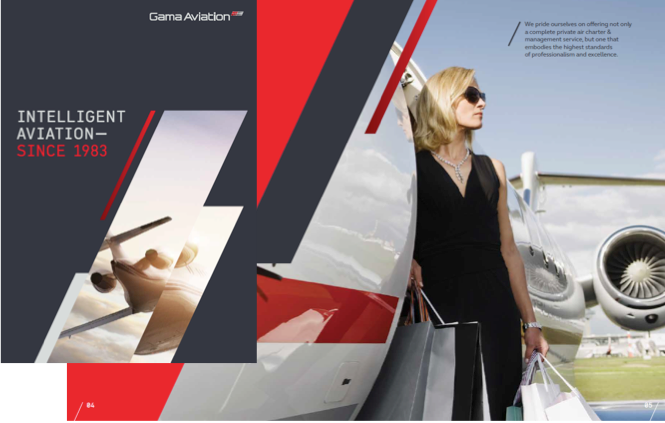 Design Inc is a specialist in business aviation marketing, Since August last year we been supporting our key business aviation marketing client Gama Aviation through their major global rebranding roll-out. This has meant working with the new ‘Intelligent Aviation Since 1983’ brand guidelines to create the graphic design and content writing for a new ‘signature’ corporate brochure as well as other tactical aviation marketing campaign materials including eshots, exhibition graphics and printed direct mail. Providing Gama Aviation with a full integrated agency service. 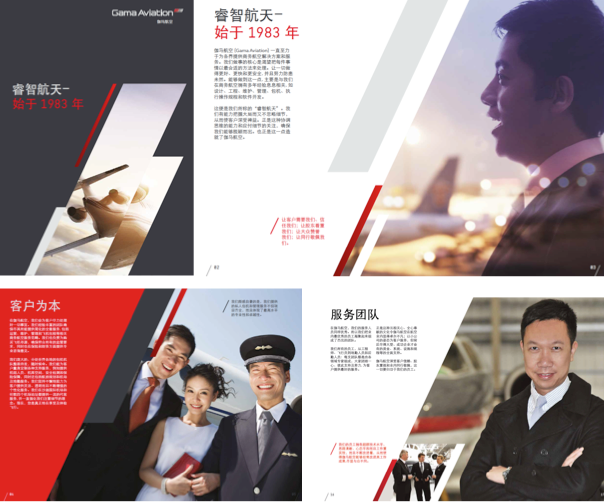 The ‘signature’ brochure sets out the stall for Gama Aviation in a global marketplace, promoting the core service areas of Engineering, Aircraft Management,Travel Services, Air Charter, IT Services, Valet Services and Leasing. In addition to the Europe/USA-centric version, this major piece of intelligent and on-demand print has been tailored and regionalised for both the Middle East and the Asia Pacific to include a partial refocusing of the design to change the emphasis of both the text and imagery. The content has also been translated into Arabic and Mandarin Chinese. This major brochure, which is printed on uncoated paper for a contemporary feel and environmentally sound specification has been very well received by the client and recently used to good effect on both the Gama Aviation stand at the NBAA Show in Las Vegas and the MEBA Airshow in Dubai. A Pdf version is also available to download from the new Gama Aviation website – again tailored to the region/ language. Design Inc started working with Gama Aviation 2013 – a proud addition to our gamut of business aviation marketing clients. Our first project for Gama Aviation being providing an innovative and branded solution to the design and production of manuals for the Training Department. Following this we have supported AIROPS Software at Farnborough, the King Air Engineering Team based at Fairoaks Airport and the aircraft Charter/Management Team both here in the UK and in Connecticut USA with aircraft marketing brochures. Design Inc are specialists in business aviation marketing services. To discuss your requirements, please contact Daniel Gilbert on 01784 410380 or by email.